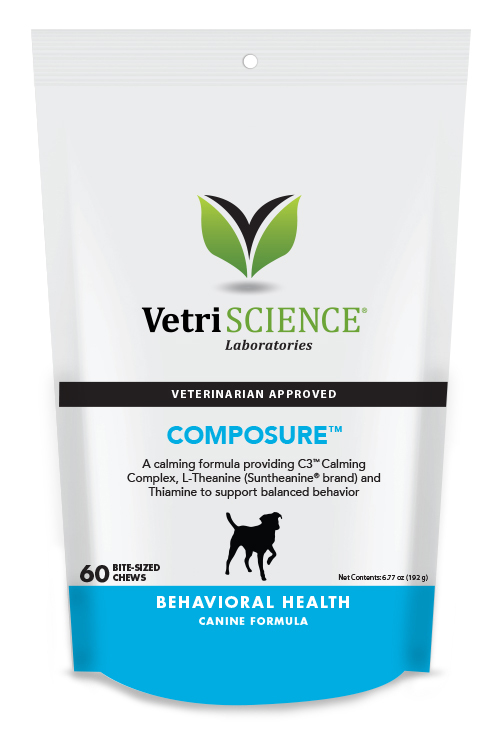 Composure™ soft chews are a calming supplement to support relaxation in situations that cause nervousness, anxiety or stress in your pet. When dogs can’t adapt to stress, it can lead to hyperactivity, abnormal urine marking, excessive scratching, trembling, pacing, excessive panting and destructive or aggressive behavior. The ingredients in Composure™ work synergistically to support relaxation without changing your dog’s personality or energy levels. The C3™ colostrum calming complex supports stress reduction and cognitive function; L-Theanine helps the body produce other amino acids to bring specific neurotransmitters back into balance; and B vitamins (thiamine) affect the central nervous system to help calm anxious animals. Our ingredients are well researched and recognized for their natural ability to support balanced behavior. When combined in our formula, they provide a calming effect to support a relaxed state without causing drowsiness or impaired motor skills. 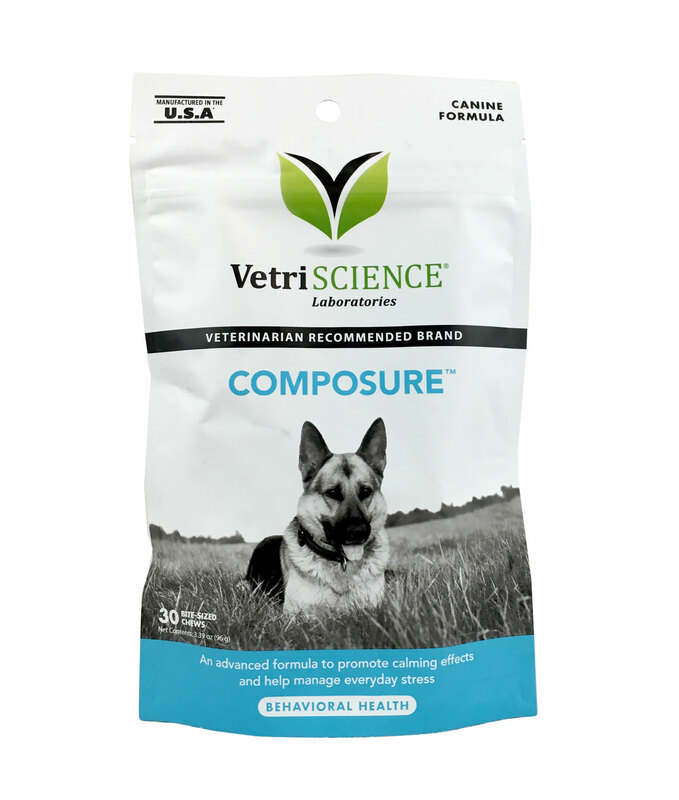 Composure™ is easily administered in a tasty chicken liver flavored soft chew and can be used as a daily supplement or, as needed in stressful situations. 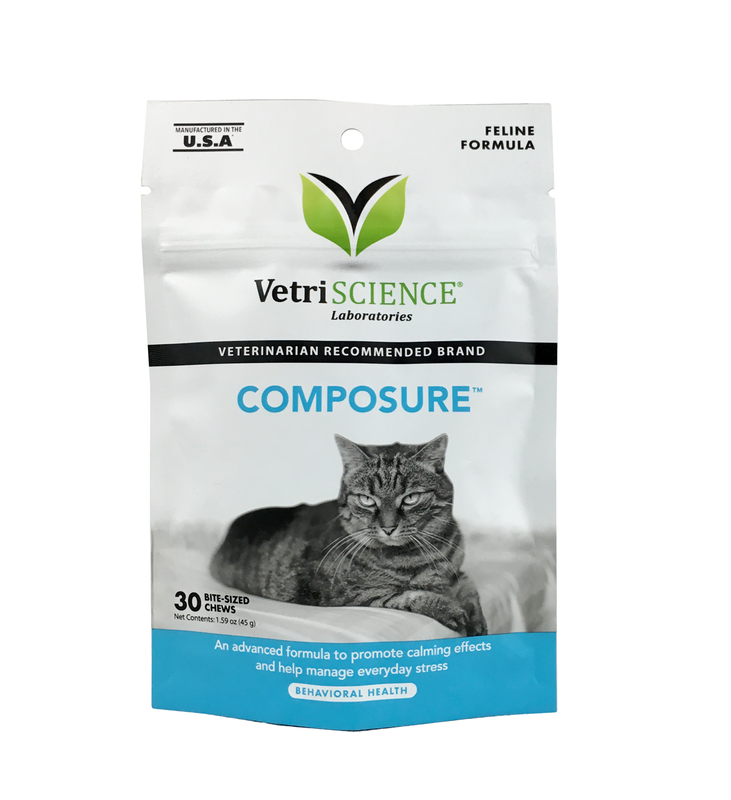 Composure™ chews for cats are a calming supplement designed to promote relaxation during stressful situations. Examples: Your cat is headed to the vet. You had a new baby. You are having guests over for the holidays. You heard there’s about to be a thunderstorm. Whenever your cat is stressed, calming chews offer positive support. Three main ingredients work together to support relaxation without affecting your cat’s energy levels or personality. No herbals used. For dogs: * 26-50 lbs: 1 chew daily. * 51-100 lbs: 2 chews daily. * Over 100 lbs: 3 chews daily. For cats: Give 1-2 chews daily. Product can be given up to two times daily or on an as-need basis.